Waze & Odyssey bring Street Tracks to Room One. The London duo’s distinctive deep house sound has defined their imprint since 2012, and this April they showcase their unstoppable sound with their first full room takeover. 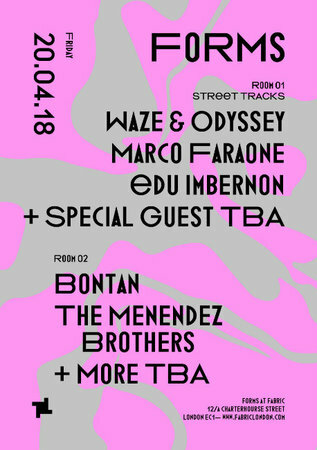 Waze & Odyssey invite Italian techno behemoth Marco Farone to make his EC1 debut alongside melodic craftsman Edu Imbernon, with more special guests to be announced soon. In Room Two, Bontan makes a return. The UK artist has a flair for writing acid house with a contemporary mood, and his sets demonstrate his expansive grasp of four-four. Also joining are The Menendez Brothers presenting their eclectic tastes in dance floor jams, with more guests soon to be announced. Tickets are now on sale via RA, with a limited number of £10 super early bird tickets. Artists / Speakers: Waze & Odyssey, Marco Faraone, Edu Imbernon, Bontan, Elliot Adamson, The Menendez Brothers, More artists TBA. 2nd release (priority entry before 1am): GBP 20.0.